Yesterday I woke up to the most beautiful day. I didn’t have to wear a jersey, the sky was as blue as could be and I could smell the Jasmine blossoming outside. I was in heaven. Spring is here! This is absolutely, without a doubt my favourite time of the year. Warming up but not as hot as hell, everyone starts cheering up and it’s like there’s just this positivity in the air. Or maybe it’s just me. I love that the December holidays are literally around the corner and that I can look forward to a long holiday of doing nothing. And as I took in the amazing smell of Jasmine whilst drinking an ice cold glass of orange juice, I knew that I couldn’t prepare a heavy Sunday lunch. I wanted to celebrate the beautiful weather and I knew just how to do it. 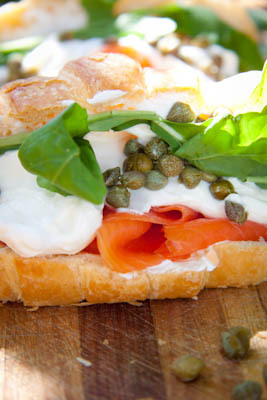 I would make my all-time favourite lunch, Fresh croissant (bagels are usually my first choice though) with smoked salmon, cream cheese and loads of capers. So off I set to go get all the ingredients and instead of grabbing the cream cheese, I decided to use fat-free smooth cottage cheese instead. After all, we should all start losing those extra kg’s we put on over winter shouldn’t we? This way you can double up on the amount of cottage cheese you put on the croissant as it’s guilt-free! YAY! Anyway, I just love, love, LOVE this way of eating. It literally took me 3 minutes to make these delightful beauties and my husband and I enjoyed them in our garden, under our beautiful pergola, soaking up the first of Spring’s magnificence. Slice open the croissants and spread half of the cream cheese on the inside. 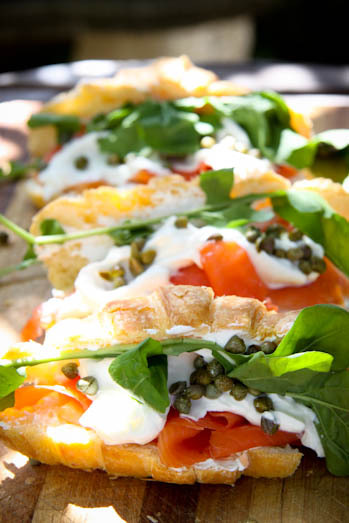 Place the smoked salmon in the croissants followed by the remainder of the cream cheese. Sprinkle over the capers and stuff a few fresh rocket leaves in there. Add a good pinch of cracked pepper and a squeeze of lemon if you want. Enjoy with a ice cold glass of crisp white wine. You might have noticed that my blog looks a bit different, (ok, a whole lot different), please let me know what you think of the new look and lay-out. Thanx so much! Ah! Thank you! I am familiar with the slightly peppery taste of arugula. Thanx Nina! 🙂 We are very proud! Well done to you and hubby for this divine site!!! You can be so proud! !